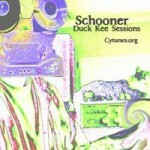 Schooner has released “Duck Kee Sessions” on cytunes.org, which means it’s download-only, but when you download it, the proceeds of your $5 goes to cancer research. This charitable aspect presents you with the perfect opportunity to discover Schooner if you’re not aware of them already: it’s only five bucks, and it’s a charitable donation, so if you end up not liking the album, it’s a tax write-off anyway. But if you don’t like Schooner, then there’s something wrong with you, friend. Their album, “Hold on too Tight” was one of the best things I heard in all 2007, and it still gets regular rotation at my house. This release, a 16-minute E.P., has a slightly less-polished sound to “Hold on too Tight”, without losing any of the quality. Schooner’s strength is blending country and pop influences into beautifully constructed songs. So on the opening track here, “Feel Better”, and you get a surf-inflected country stomp, you get a little mariachi inflection on “Fortuition”. The songs always seem to be hovering over a meeting of Rick Nelson, Brian Wilson and John Lennon. But again: these are influences used by a band that exudes an authentic originality, not the direct pinpoints of some derivative songwriting and playing. This is a band with brains: they are lyrically smart without being smartass, and when it comes to instrumentation the songs don’t rest on a couple guitars and drums and bass; piano comes and goes, “Duck Kee Nights” is an instrumental tack piano (I think) piece with the sounds of the crickets and the highway as a rhythm section, some ukulele helps you “Lose Yourself”, and across these songs there are various percussion and other instruments lending subtle and effective underpinning to the fabric. There’s also much to be said for the vocal arrangements: harmonies and backing vocals are consistently beautiful and/or dynamic (witness the woo-oo-oos on the opener, or the ba-ba-ahs that course through the final track, “In All Probability”). When I reviewed “Hold on too Tight” a few years ago, I said you should be prepared to make Schooner your new favorite band. I don’t want to repeat myself, so this time I’ll just say go to cytunes.org and buy this album. It’s worth way more than the five bucks it’ll cost you, and the money’s going to a good cause. Once you’ve done that, then go and buy “Hold on too Tight” so you can support this outstanding band, too. This entry was posted in Albums, Reviews and tagged schooner on March 14, 2010 by Doug Cowie.